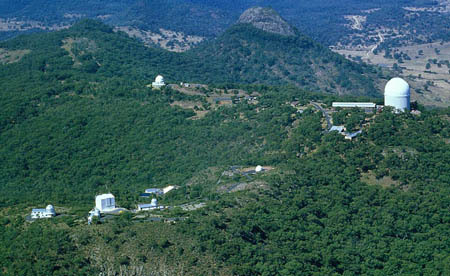 Aerial view of Siding Spring Observatory. Siding Spring Observatory is Australia's largest optical astronomy facility. It is located 27 kilometers west of Coonabarabran on Siding Spring Mountain in New South Wales, at an altitude of 1,165 meters (3,785 feet). Its main instruments are the 3.9-meter (154-inch) Anglo-Australian Telescope and the 1.2-meter (48-inch) UK Schmidt telescope.